Linux.com’s Tina Gasperson has reviewed the Intel 400USD Classmate PC (laptop) that is targetted to South and Central Americas. Apparently, she and her family enjoyed. Linex, a version of Linux, has been successfully developed and deployed in the educational field by the regional government of Extremadura, Spain, Europe. Discover how this project, by getting rid of the Microsoft dead end, has made Extremadura one of the most equipped region in computers and Internet access : watch this Euronews video (English) (French version). Equipped with a Celeron M 900 MHz, 256 Mb DDR2, 1-2 Go Flash memory, Intel 915GMS video chipset, a 7″ screen (800×480), a waterproof keyboard, Wi-Fi 802.11g and Eth ports, the Classmate PC weights 1.3 Kg and costs 400USD, more than the OLPC’s XO. Anyway, this is a major initiative, espcially because Intel is behind it and because it’s targetted to the south-American education sector which should allow an easier access to computing for millions of students and teachers. What else? 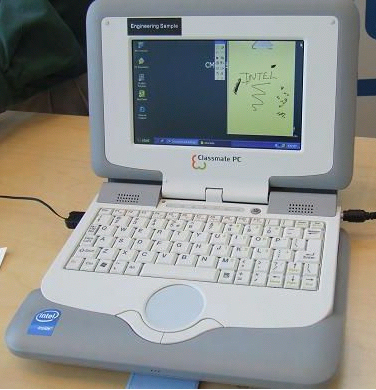 It’s preloaded with XP and/or Mandriva Linux and/or Metasys Classmate. The choice apparently depends on needs and region. I can just hope that the price varies depending on the installed OS. I was born in 1973 and got my Master’s degree in Computer Sciences (Systems & Networks) at University in 1997. In 1998 I created the popular Mandrake-Linux system which was the first Linux distribution to care about ease of use (6 years before Ubuntu actually). Then I co-founded Mandrakesoft which went public in 2001. Mandrake-Linux later became Mandriva Linux with the aquisition of Conectiva in Brazil, it was acquired in 2010 by a Russian Investment fund. There is a chapter about the early story of Mandrake-Linux and Mandrakesoft, and how we took part of the Linux & Open Source revolution, in this excellent book “Rebel Code” by Glyn Moody (here at Amazon, here at Google Books for a preview). Starting from 2007, I’ve developed the Ulteo project, a multi-platform application and desktop delivery solution for corporates, with partners. The project was aquired in 2014 by AZNetwork SAS. In 2015 I’m working on building a “Startup Factory” with partners, called “NFactory”, launching September 2016. I also have new projects linked to mobile development, Artifical Intelligence and chatbots in my spare time. I’m generally performant at envisioning and bootstraping new projects from mostly nothing. I’m especially interested in participating in potentially disruptive projects in the software industry (AI…) and/or in the “energy field” (photovoltaics, electricity storage, electric cars). Since 2016 I’m an Advisor for the CommonSearch: project, a radically transparent search engine for the web. In 2017 I started /e/, a mobile phone OS and associated web-services with respect of user’s privacy. This is a non-profit project, in the public interest (see the crowdfunding campaign here).